The Boogie East Chopper Show began with a lot of history. Scott Hoepker, of Chemical Candy Customs, Tani Labarbera, Annie Oakley’s Co-owner, and Rob Clague from Gasshole, all grew up together working for Tani’s father Pete, laying brick in small East Texas town. Pete introduced them to his Shovelheads and Panhead at an early age and they’ve been dreaming of choppers ever since. Eventually Pete left the masonry business and moved to Florida to open a biker bar. Years later, Pete passed from cancer. Unfortunately, the guys didn’t have a chance to get out to Florida to visit beforehand. About a year later, Rob and Scott went to check out the bar and see Tani. This was where the Boogie East Chopper Show all began to blossom. Along the bar hung old photos of Pete and his Shovelhead. It brought them back to the days they were throwing back beers and dragging back their first Ironhead in pieces to Pete’s garage. This biker watering hole was the perfect spot for a true chopper event/party. They came up with this show to commemorate Pete LaBarbera. This was the second Boogies East put on by the guys over at VNM, Gasshole, and Chemical Candy Customs. This world class chopper show takes place at the Daytona Bike Week, intending to bring together the chopper community to celebrate the vintage culture. 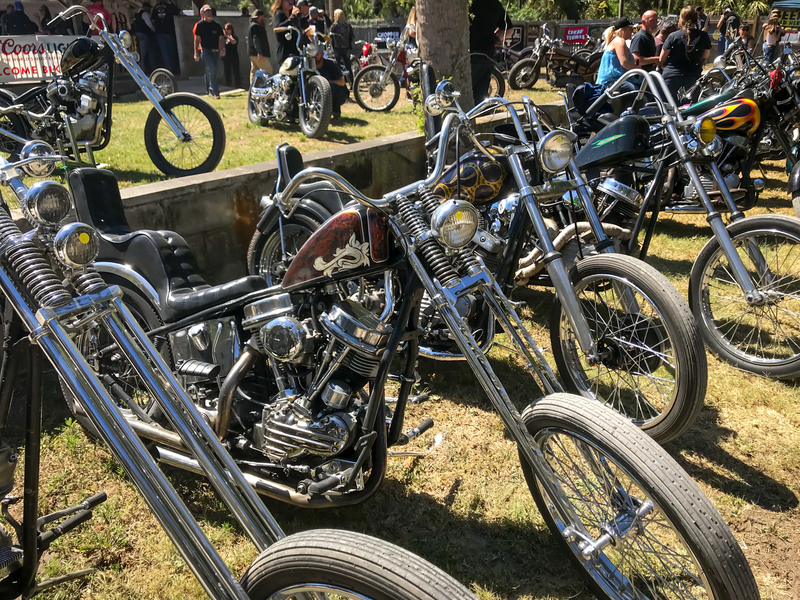 A day filled with drinks, good people, music, and show bikes limited to 1983 choppers and earlier; it doesn’t get much better than that. From classic to wild motorcycles, you name it. People walked around in awe at the artistry displayed on each motorcycle. The event was a great turnout and we expect this show to continue grow at next year’s rally. Thank you Giselle Levy, for providing the event coverage!